In the Salar de Antofalla area, volcanic activity was important during the Cenozoic but was also present during the Permian and Early Jurassic as indicated by some lavas and thin pyroclastic layers. Cenozoic volcanism is mainly documented by recently inactive stratovolcanoes and monogenetic vents. The products of these centers comprise pyroclastic rocks and lavas which occur as intercalations or at the top of the stratigraphic sequence. An important feature are many low-volume ignimbrites (< 10 km³) and few larger widespread ignimbrite sheets. New K-Ar and 40Ar/39Ar mineral and whole rock ages reflect volcanic activity in the Salar de Antofalla area or its vicinity at least from the Late Eocene to Late Pleistocene. The volcanic evolution during this time interval can be subdivided into three periods based on changes in amount and composition of the volcanic products and different structural features. The first stage from Late Eocene to Early Miocene is characterized by relatively low volcanic activity. Throughout the working area, only a few thin (< 15 cm) pyroclastic layers intercalated within the sedimentary strata have been found. They are intermediate to acid crystal-rich ash-fall tuffs which consist of feldspar, brown hornblende, (oxy)-biotite, and quartz in a glassy to recrystallized, fine-grained matrix. Their scarce occurrence, fine-grained texture, and the lack of lithic components indicate that the eruptive centers of the pyroclastic rocks were located outside the study area, perhaps in the present Chilean Precordillera. Their ages range from 37.6 ± 0.3 Ma to 22.5 ± 0.6 Ma. The second stage is marked by a dramatic increase in volcanic activity during the Middle Miocene, expressed by the development of several stratovolcanic centers. These centers (Cerro Beltrán, Cerro Tebenquicho, Volcán Archibarca, Fig. 2) are built up by voluminous long-lived compound flow and dome complexes. The Volcán Antofalla complex consists of a group of stratovolcanoes. They are mainly made up of silicic andesites, dacites, and rare rhyolites. Ignimbrites and pyroclastic fall deposits of the same age occur widespread in the area. The ignimbrites have low volumes and are generally of the valley-fill type with the exception of the plateau-forming Tambería ignimbrite (see Geological map). Because of the numerous andesitic-dacitic stratovolcanoes, the assignment of individual ignimbritic units to specific eruptive centers is often unclear. The main outcrops are situated in the west and northwest of the Salar de Antofalla and in the south of the Salar de Incahuasi. Radiometric ages allow a general survey of the eruptive history of stratovolcanic complexes and pyroclastic deposits. The earliest stratovolcanic eruptions are indicated by andesitic boulders in conglomerates of the Potrero Grande Formation. Intercalated volcaniclastic rocks and various pumice-fall tuffs yielded ages of 18.5 ± 0.5 Ma and 18.0 ± 0.6 Ma. The oldest age for stratovolcanic lavas stems from a dacitic lava flow of Cerro Beltrán (14.1 ± 0.4 Ma. Younger ages of several intermediate lava flows of the Cerro Beltrán and the Cerro Tebenquicho document the continuous build-up of stratovolcanic complexes up to the Late Miocene (5.96 ± 0.03 Ma). The oldest ignimbritic rocks are exposed in the Agua Escondida Ignimbrite dated at 15.0 ± 1.0 Ma and 13.5 ± 1.5 Ma (Coira and Pezzutti 1976; Coira et al. 1993). They are followed by some ignimbrites dated between 10.9 ± 0.3 Ma and 9.6 ± 0.2 Ma. The youngest pyroclastic rocks of this stage occur south of the Salar de Incahuasi (6.3 ± 0.2 Ma). The stratovolcanic complexes are located along the NW-trending Archibarca lineament which crosses the Western Cordillera. Faulting of the centers related to the lineament has not been noted. The lineament has been interpreted as a zone of crustal weakness (Salfity 1985). The characteristic features of the third stage are numerous monogenetic centers and a widespread ignimbrite sheet. The eruptions of this type were accompanied by activity of the stratovolcanoes which is documented by intermediate lavas and low-volume ignimbrites (Ignimbrites: e.g. south of Salar Incahuasi, ignimbrite Campo de la Piedra Pómez, 0.2 ± 0.1 Ma; lava flows dated by Coira and Pezzutti (1976): Cerro Cajeros basaltic andesite, 4.8 ± 2.5 Ma; Aguas Calientes basalt, 2 ± 1 Ma). The monogenetic centers consist of cinder cones and lava flows characterized by small volumes (< 2 km³) of mainly basaltic andesites and subordinate basalts, andesites, and dacites. Based on their ages two groups can be defined. Most of our age data lie in the range between 5.3 ± 0.3 Ma and 3.61 ± 0.02 Ma, and two older age of andesitic flows (12.8 ± 1.2 Ma, 7.0 ± 0.3 Ma) have also been obtained. The centers of this age range greatly dominate the monogenetic suite. These cones are partly eroded and their lava flows exhibit levelled surfaces. We suggest, therefore, that monogenetic activity had a maximum at this time followed by a more quiet period up to the present. There are a few younger cones which are almost perfectly cone-shaped with steep slopes and fresh rugged flow surfaces. One of these cones at the southern edge of the Salar de Antofalla has been dated at 0.2 ± 0.09 Ma. To the east of the Salar de Antofalla, the cinder cones are located at NE and N-trending reverse fault and thrust systems. We suppose that magma ascent between 6 and 4 Ma was made possible by the relaxation between the deformation phases D3 and D4. In the northwestern part, structural control on cone formation is not obvious. The second prominent feature of the youngest stage is the Vallecito ignimbrite sheet (10 - 100 km³) which crops out south and southwest of the Salar de Antofalla. Its maximum thickness measured at the western border of the Salar de Antofalla is 20 m. In part the ignimbrite fills the southern section of the salar basin. Its source was presumably located west of the salar. Two pumice-poor flow units have been distinguished. The upper unit has an age of 3.605 ± 0.005 Ma (ID-11). 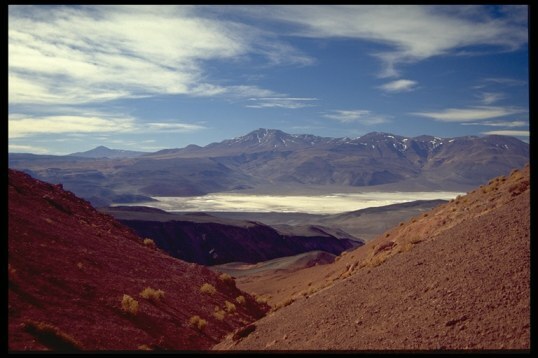 for citation use: Kraemer, B., Adelmann, D., Alten, M., Schnurr, W., Erpenstein, K., Kiefer, E., van den Bogaard, P. and Görler, K. (1999): Incorporation of the Paleogene foreland into the Argentina Puna plateau: The Salar de Antofalla area, Southern Central Andes. Journal of South American Earth Sciences 12/2.